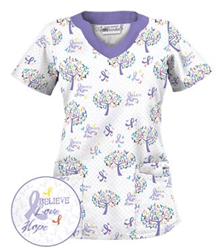 Uniform Advantage will donate $1 from the sale of each “Tree of Hope White” scrub prints to the Pancreatic Cancer Action Network this Spring 2015. To learn more, please visit http://www.uniformadvantage.com/a-day-in-scrubs/ua-gives-back/pancreatic-cancer-action-network.asp. When Uniform Advantage was researching several charitable organizations to support, we chose Pancreatic Cancer Action Network because of the great strides they have made in bringing more attention to this disease. Pancreatic cancer has the lowest relative five-year survival rate of all major cancers at just 7 percent. The Pancreatic Cancer Action Network was founded in 1999 with a mission to advance research, support patients and create hope for those affected by the disease. The organization has a bold goal: Double pancreatic cancer survival by 2020. Since 2003, it has privately funded 112 research grants totaling nearly $23 million, and its grassroots advocacy efforts have helped increase federal funding for pancreatic cancer research by $87.5 million since 1999. This Spring 2015, Uniform Advantage will donate $1 from the sale of each “Tree of Hope White” print to the Pancreatic Cancer Action Network in support of the fight against pancreatic cancer. The total donation is expected to equal more than $3,000. The Pancreatic Cancer Action Network is the national organization creating hope in a comprehensive way through research, patient support, community outreach and advocacy for a cure. The organization is leading the way to increase survival for people diagnosed with this devastating disease through a bold initiative — The Vision of Progress: Double Pancreatic Cancer Survival by 2020. Together, we can Wage Hope in the fight against pancreatic cancer by intensifying our efforts to heighten awareness, raise funds for comprehensive private research, and advocate for dedicated federal research to advance early diagnostics and better treatments and increase chances of survival. For more information, visit http://www.wagehope.org.